Hot off the presses, the February 2017 edition of The First Shot. Calling All Compatriots! The camp will be doing clean up at Oakwood Cemetery on March 1, 2017 (tentative date) and at Hollywood Cemetery on March 14 ,2017 (confirmed date). Exact times for each clean to be announced. We are looking for as many volunteers as possible. Let’s roll our sleeves up and make this a huge success. All pickups, dumptrucks & trailers are welcome that can be used to haul alway the debris that we clear away. Here is a list of tools that will be need during the clean up. Please bring what you are able to help us get the job done! REMEMBER – No power tools are allowed when we are doing clean ups at Oakwood, pursuant to the Oakwood Restoration Committee. Can you believe it is time to get ourselves out of the February Funk and out to the Fire Eater March 1 Meeting? Yep! It is that time again. The Fire Eaters will convene at 6:00 p.m. on Wednesday, March 1, 2017 at 6:00 p.m. for Dinner at Anna’s Italian Restaurant on Mechanicsville Pike for dinner, with Formal Business Meeting to follow at 7:00 p.m. Commander Joe Wright has promised an eventful and exciting meeting, as usual! So come on down. 2. “I hate to hear laughter”. 3. “I hate to see others having fun”. 4. “I hate to enjoy a great meal of Italian Food”. 5. “I cannot stand frivolous and boisterous behavior”. 6. “I do not like to learn about the War for Southern Independence”. 7. “I do not like to hear interesting and informed speakers”. 8. “I do not like to socialize and fellowship with nice southern men and women”. 9. “My wife is requiring me to clean out my closet on the first Wednesday of every month”. 10. “I have no interest in hearing anything that our scandalous 1st Lt. Commander has to say”. Can you believe such reactions? The only one I can believe is Number 10, because I have to agree with that one. You will have fun; you will enjoy the fellowship with other southerners; you will laugh (good for your health); you will enjoy a great Italian Dinner; you will see Compatriots, Friends, Ladies of the Camp and guests having fun together; you will witness frivolous and boisterous behavior (and there is no telling what “THE INSTIGATOR” will instigate); you will hear an interesting and knowledgeable speaker to learn about Southern culture and events during the War for Southern Independence; you might witness the impeachment of the 1st Lt. Commander; and Sonny Fauver has agreed to clean out everyone’s closet on the day after the Meeting! Our speaker for the evening will be Art Taylor. Mr. Taylor is a native of Richmond, VA, and is a historian familiar with the 1860s in Virginia. He will speak on a wide variety of events that occurred in and around Hanover County during the War years. It should be interesting and informative. We are still looking for the Camp Harley, which went missing from my driveway some time before the last meeting. We will pursue the perpetrator vigorously to the full extent possible; and anyone with any suspects in mind should contact the Camp Commander immediately. (Cathy Hendricks immediately comes to my mind!) The Camp Corvette will be brought to the Meeting, per the instructions of the Camp Commander. One final note: If we do not have a quorum at the meeting, the Camp will not be allowed to vote on the impeachment of the 1st Lt. Commander! So stay home and clean out your closets!!!!! See you Wednesday, March 1 for the Festivities that are the Hallmark of Fire Eater Camp Meetings. I have a few items for your consideration. 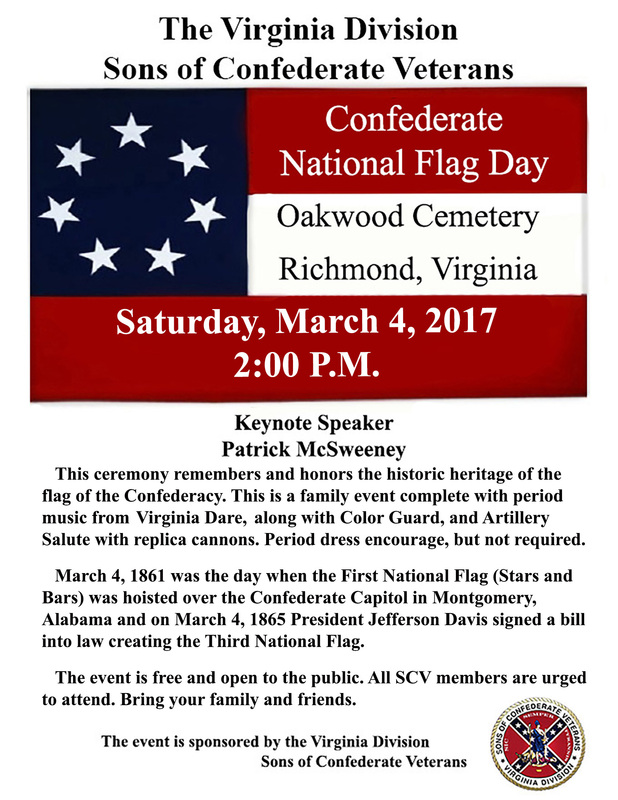 First and foremost, Confederate Flag Day will be held 2pm Saturday, March 4th at Oakwood Cemetery. Attached is a flyer for you all to forward out to the members of your camps. We have quite an event planned so come on out and support the Virginia Division. Secondly, remember that Outstanding Camp Award submissions should be submitted to the Division Commander by the end of March. Along those lines, the Division Reunion is scheduled for the weekend of April 21st-23rd in South Boston. For registration information, visit the John M. Jordan Camp # 581 website at johnmjordanscv.org. I look forward to seeing you all there. Also, please consider the possibility of your Camp sponsoring a child for, or volunteering to help with, the Sam Davis Youth Camp which will be held June 18th-24th. 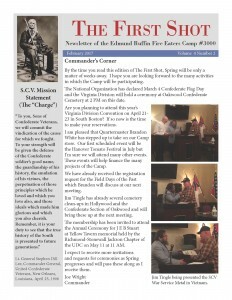 For more information on this camp, contact Past Commander Tracy Clary at 434-774-4341. Finally, there will be a Mosby Spring Bus Tour on Saturday, June 24. A flyer for this event is attached as well. Please put Flag Day on your calender!